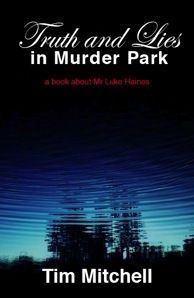 'Tim Mitchell's "Truth And Lies In Murder Park" (Benben Press) journey's into the mythology of the British singer-songwriter Luke Haines to conjure a fictional narrative with fragments of biography. As the title acknowledges this is not faction as such, rather an impressive and heart-felt testament to the imagination of the the so-called 'Godfather of Britpop'. Luke Haines may now have been cast into a minor supporting role in the history of British music, albeit with a rabid cult following, yet as Mitchell's book testifies his artistic legacy is far greater and richer than that of any of his contemporaries. Which other songwriter in recent history would facilitate such a feat of imagination as Mitchell lays before the reader here? For a comparative mythology one would have to look to rock icons such as Bob Dylan or Tom Waits to locate such a lineage. Indeed, Mitchell's book weaves in the vast array of Haines's obsessions and characters into a hallucinogenic narrative that evokes the surrealism of Powell & Pressburger's "A Matter Of Life And Death", a film that has registered upon Haines's own radar. Indeed, for Haines's aficionados, 'Truth And Lies...' greatest strength is the way it sheds new autobiographical light upon Haines's work. Coming shortly after Luke Haines's own incorrigible autobiography, itself a scorched earth policy on the Brit Pop years, this is no minor accomplishment. 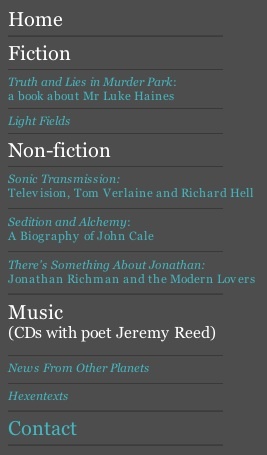 Certainly, the appendix credits Luke Haines for his involvement in the book, but it is the readings of Haines's songs that Mitchell so excels at. He extracts the big themes of those early Haines albums with The Auteurs and showcases them anew, and in doing so exposes the profundity that distinguishes the music to this day. Regarding the The Auteur's 'After Murder Park' - from which this novel appropriates its name - Mitchell is especially strong. He reveals the haunting back story to 'Unsolved Child Murder', the autobiographical origins of The Auteur's most poignant song. "When I was five, he (Haines) said, the kid at the end of the road disappeared and was found - murdered. His Father was a doctor. Up until that point I had believed - naively - that the healing powers of doctors made them untouchable by tragedy." :17:65:6c:63:63:32:4:1:17:74:4:1:17:60:5d:17:1f:17:6a:6b:58:69:6bagination of the the so-called 'Godfather of Britpop'. Luke Haines may now have been cast into a minor supporting role in the history of British music, albeit with a rabid cult following, yet as Mitchell's book testifies his artistic legacy is far greater and richer than that of any of his contemporaries. Which other songwriter in recent history would facilitate such a feat of imagination as Mitchell lays before the reader here? For a comparative mythology one would have to look to rock icons such as Bob Dylan or Tom Waits to locate such a lineage. Indeed, Mitchell's book weaves in the vast array of Haines's obsessions and characters into a hallucinogenic narrative that evokes the surrealism of Powell & Pressburger's "A Matter Of Life And Death", a film that has registered upon Haines's own radar. e title acknowledges this is not faction as such, rather an impressive and heart-felt testament to the imagination of the the so-called 'Godfather of Britpop'. Luke Haines may now have been cast into a minor supporting role in the history of British music, albeit with a rabid cult following, yet as Mitchell's book testifies his artistic legacy is far greater and richer than that of any of his contemporaries. Which other songwriter in recent history would facilitate such a feat of imagination as Mitchell lays before the reader here? For a comparative mythology one would have to look to rock icons such as Bob Dylan or Tom Waits to locate such a lineage. Indeed, Mitchell's book weaves in the vast array of Haines's obsessions and characters into a hallucinogenic narrative that evokes the surrealism of Powell & Pressburger's "A Matter Of Life And Death", a film that has registered upon Haines's own radar.